How to Grow Moss For a Terrarium | Make A Terrarium! Moss makes a great terrarium plant because it's small, hardy, and thrives in a humid environment. It grows everywhere, so you can usually find some nice moss just by stepping outside your house. What I love about moss is its tiny scale. 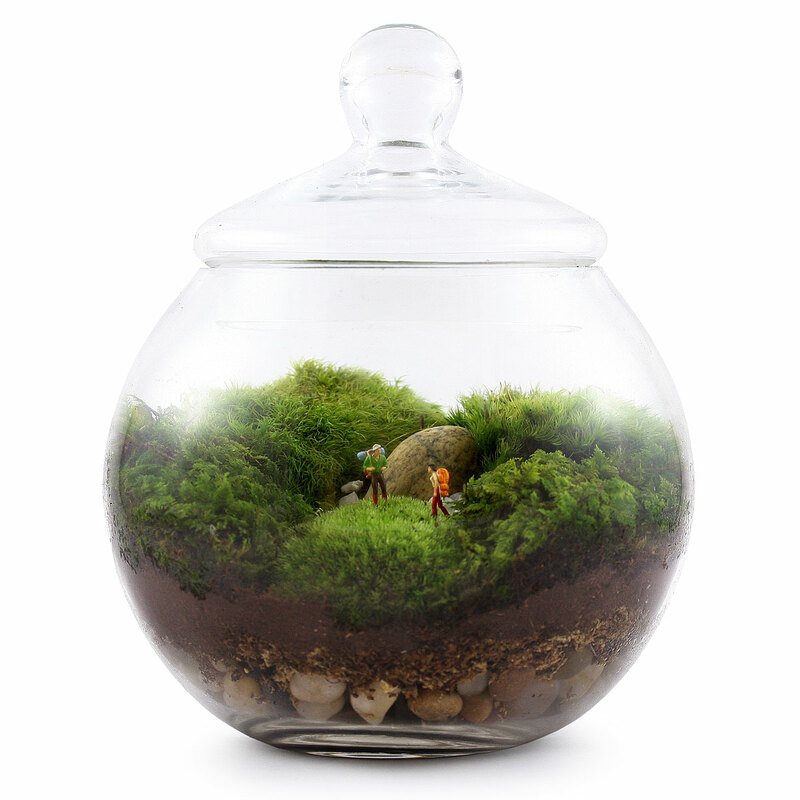 A layer of moss inside a small jar magically looks like a tiny grass meadow, allowing you to create all sorts of miniature terrarium worlds. How do you grow moss? Luckily it's pretty easy. First, you have to find some moss. There are tons of places online that will sell you some moss, but you can also just go outside and look for some. Moss grows in shady, rocky areas, so check the bases of trees, cracks in the sidewalk, or next to your house. Once you've found a nice patch of moss, use a shovel to pull up a small section of it. Make sure to get a good amount of dirt under the moss too. Moss roots don't grow very deep, but you want to make sure not to damage them too much. If you can't find any moss outside, you can also buy some online. Here's a nice assortment from Amazon . It's a good idea to check your moss for insects or other debris before putting it in your terrarium, especially if you plan on having other plants in there as well. It might even be a good idea to quarantine the moss for a few weeks to make sure there aren't any insect eggs that might hatch. If your terrarium is only going to house the moss, then you don't need to worry as much about contamination. Building a moss terrarium is very similar to building a regular terrarium (see basic terrarium instructions here). Start by putting about an inch of small stones or pebbles in the bottom of your container. The pebbles create a place for water to drain into which keeps your plants from sitting in a pool of water. The next step is optional. Add a layer of activated charcoal over the stones. The charcoal helps keep your terrarium fresh and discourages mold. Over the charcoal, add a thin layer of sphagnum moss to keep the soil from washing down into the stones. The reason this is optional is because moss isn't a very picky plant. Adding the charcoal and sphagnum will help keep everything nice and fresh looking though. Now, add a thin layer of soil over the stones. You only need about an inch or two because moss doesn't grow very deep. Arrange your moss in the container however you'd like it. Add some decorative rocks, wood bits, or figurines to create your scene, and you're done! Although moss grows in shady areas outside, when you bring it in your house it actually needs a decent amount of light. Place your terrarium in a well lit room, but out of direct sunlight. If you place it right in a bright window, you'll cook your moss! Moss does best with light, frequent watering. The best way to water a moss terrarium is to spray it lightly with a spray bottle about once a day. Covered terrariums are great for moss, because the lid will keep some humidity in and keep the moss moist. Keep an eye on the terrarium for a few weeks until you figure out how much water it needs. If there is too much condensation collecting on the glass, remove the lid and let it air out for a few hours. That's all there is to creating a beautiful moss terrarium. Good luck!